SAN DIEGO, Nov. 10 (UPI) -- The disabled Carnival cruise ship Splendor was being towed to San Diego after an engine room fire knocked out the ship's propulsion and power, officials said. The USS Ronald Reagan, an aircraft carrier, was diverted from its training maneuvers to deliver 4,500 pounds of supplies, including Spam and bottled water, to the ship that has been dead in the water off the western Mexican coast since Monday's fire, The San Diego Union-Tribune reported Tuesday. 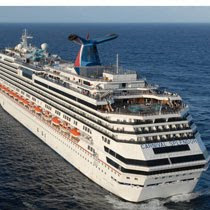 The ship is carrying 3,299 passengers and 1,167 crew members, Carnival said on its Web site. While the guests have functioning toilets, they can't make phone calls, have no air conditioning or showers and are eating pre-packaged meals because the ship has no refrigeration. The Splendor is expected to arrive in San Diego Thursday, but officials said it could be detoured to Ensenada, Mexico, if sea conditions make it necessary. Carnival Cruise Lines originally planned to tow the Splendor to Ensenada, but switched to San Diego "given the ship's speed and current position," the cruise line said in a statement Tuesday. Capt. Anthony Gentilella, aboard the U.S. Coast Guard Cutter Morgenthau, which is accompanying the Splendor, said he hopes conditions cooperate. "You can have one more thing go wrong and it can turn disastrous. We don't want to run out of water or stay out here three or four more days," Gentilella told the San Diego newspaper. Officials said they will investigate the fire's cause after the Splendor returns to port. What happened aboard the Splendor offers a warning about the vulnerabilities of so-called "floating cities," observers told the Los Angeles Times. "There are significant risks as these ships get bigger and bigger," said Kendall Carver, president of International Cruise Victims. "A fire on a ship like that would be disastrous."